Think you can’t rack that slide? Try this. Lots of new shooters, especially women, limit their options for handguns because they think they can’t rack the slide. 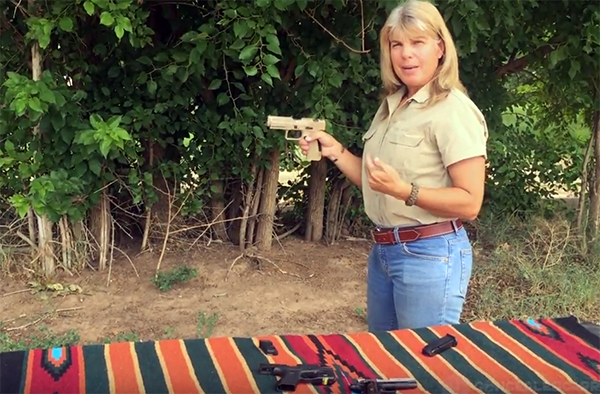 This essential pistol function is easy and safe with the technique shown here, which simply add the laws of physics to your natural core strength. Hand and strength is not really necessary when racking this way. I’ve seen people with a variety of hand disabilities, some quite severe, use this technique to master the gun they really wanted, not the one they thought their condition forced them to choose. An added advantage of this method is that it’s always available when stress or cold has reduced dexterity in the fingers. That’s a real survival skill! Check out this video and share it with anyone you know who thinks slide-racking is too hard for them. Do you have any issues racking your semi-automatic slide? Did this method help you at all? Let us know in the comments below. And, if you have any other tips or tricks you'd add, please do in the comments, below. Propper sponsored the summerweight shirt in this video. Gun belt by Exos Gear. as an instructor, I like your videos and the simplicity of your teaching methods. one comment on having students push the gun forward to rack the slide. as I am sure you are aware, if they have a finger on the trigger they are likely to press the trigger while pushing the gun forward. I would emphasis keeping the finger off the trigger. PS – I successfully taught a 95 year-old woman to rack using this method. AWESOME video and instruction. As a 65 year old woman, I have always struggled with this. THANK YOU for posting! Sheila, we’re glad you found it useful. Thanks for the comment.